This is a southern Thai dish that I picked up on my travels. The broth has a fragrant, spicy flavour and is great for lunch or as a light dinner. Heat a large saucepan over a medium heat. To make the paste, place the chillies in a food processor with the garlic, ginger, ground coriander, fresh coriander and groundnut oil, then blend together to form a coarse paste. Add the paste to the heated pan and stir-fry for 1 minute, then pour in the coconut milk and stock and bring to the boil. Reduce the heat and simmer the sauce for 20 minutes to allow the flavours to combine, stirring occasionally until slightly reduced. Meanwhile, place the noodles in a large saucepan of boiling salted water and then immediately remove the saucepan from the heat. Set aside for 8-10 minutes (check the packet instructions). Drain and refresh the noodles under cold running water and set them aside. Blanch the sugar snap peas in a small pan of boiling salted water for 1-2 minutes or until just cooked, then drain and refresh under cold running water. Set aside. Add the fish sauce to the coconut mixture along with the squid, monkfish and prawns and stir gently for just a few seconds until just cooked through and tender. Add lime juice to taste. Divide the cooked noodles among warmed bowls and scatter the sugar snap peas on top. 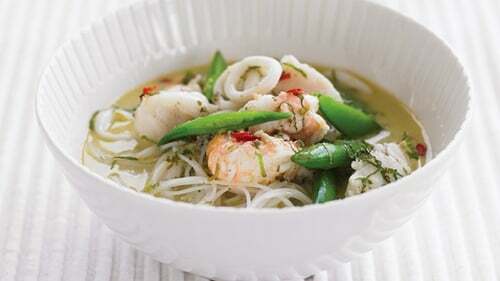 Ladle over the coconut broth and garnish with the mint and basil leaves, spring onions and chillies to serve. Neven's tip: For a variation, you could substitute the seafood with chicken, pork or beef, cut into wafer-thin slices.